Nicholas Imparato is a professor of marketing and management at the University of San Francisco and, since 2011, chair of the Department of Marketing (originally the Department of Marketing and Law). 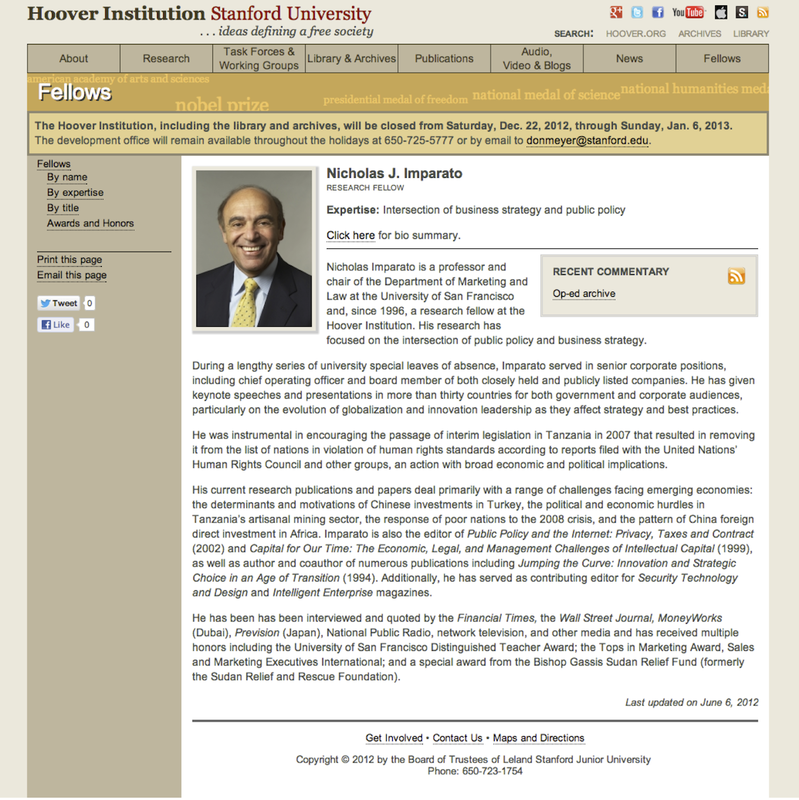 He is formerly a research fellow at the Hoover Institution, Stanford University (1996 – 2012). During a lengthy series of special leaves of absence from the university, he held positions as a senior executive and board member at publicly listed (NYSE, NASDAQ) and closely held companies here and in Europe. As a speaker and advisor in over 30 countries with Visa, IBM and other organizations, professor Imparato focused on projects regarding marketing, innovation and leadership. He has been interviewed by the Financial Times, the Wall Street Journal, MoneyWorks (Dubai), Prevision (Japan), NPR Radio (National Public Radio), network television and other media. Professor Imparato is an author, co-author, columnist and editor of over a hundred trade, A-level and other academic journal articles, book chapters and books. He has received awards for teaching, research, professional achievement and public service, including the University Distinguished Teacher Award and the Tops in Marketing Award, Sales and Marketing Executives International.